This entry was posted by Jen on August 9, 2010 at 12:58 pm, and is filed under Oh the things Nathan does. Follow any responses to this post through RSS 2.0.You can skip to the end and leave a response. Pinging is currently not allowed. This was Nathan’s handy work? 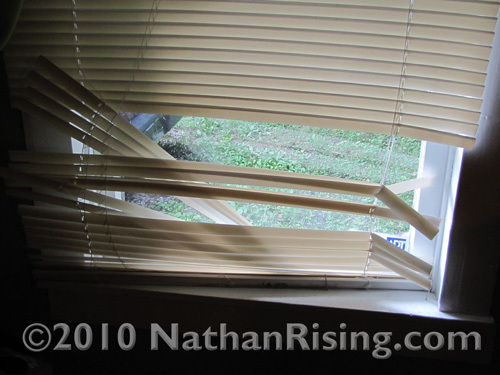 My cats used to destroy our blinds,then the kids started helping, and then the dogs chipped in…now, everyone has been trained. Yes, this deed was done by none other than Nathan! Thankfully the cats have already been trained, but it looks like Nathan still has a ways to go!